With Federal Reserve and government doing their best to stimulate demand, people have started looking at inflation. The worry is that the economy is not as sick as our policymakers think, and so the fiscal and monetary medicines are excessive. Markets disagree. Expected inflation is an important determinant of future inflation. If the public expects higher inflation, workers demand higher wages, prompting employers to raise the price of their goods, which results in higher actual inflation. Markets in fixed-income securities provide timely information about inflation expectations. Treasury inflation-protected securities (TIPS) deliver interest and principal payments that are tied to inflation. Payments from regular Treasury notes, on the other hand, are not indexed to inflation. The difference between the yield rates of the two types of securities must be equal to the inflation rate expected by the markets—otherwise there would be an arbitrage opportunity. In practice, because of technical issues, the yield spread is only an approximation to expected inflation, and people call it the break-even inflation (BEI) instead. (More on this below.) From here on I use BEI and “expected inflation” interchangeably. Because the Treasury has created notes with different maturities, we can use the spread between nominal and TIPS securities to gauge inflation expectations for different horizons. For example, today’s difference between the yield of five-year TIPS and that of five-year nominal notes is approximately equal to the inflation rate expected over the five years starting now (2008-2012). The Fed is interested in long-term inflation expectations, because in the short term prices are affected by transitory or volatile factors, such as commodity prices. One measure of long-term expectations, which we can also derive from yields, is the five-year, five-year forward rate. That is an approximation to the rate of inflation expected for the five years starting five years from now. Today, that would be the period from 2013 through 2017. Earlier this month Greg Ip of the Wall Street Journal posted a graph showing the five-year, five-year forward BEI, which generated some discussion in the econ blogosphere. Felix Salmon and Greg Mankiw worried over signs of increasing inflation coming from that graph. Mankiw went as far as saying that the rise in expected inflation is “consistent with the hypothesis that policymakers are overreacting to some economic news with excessive monetary and fiscal stimulus.” Following up on knzn’s analysis (Feb. 3), I find that the worries about inflation in the far-future are overstated—and that inflation expectations over the near-future have been overlooked. Using knzn’s back-of-the-envelope method, I have produced my own time series of forward BEI, which matches the one posted by Ip quite closely (see chart 1). The graph shows that starting on January 15, the rate of inflation expected for the far future (2013-2017) started increasing abruptly. By the time Ip’s graph was produced, January 30, the forward BEI had increased by 16 basis points. That is not unusual. We have seen increases of similar or larger size in 2007: between March 9 and March 27 (15 b.p. ), May 26 to June 13 (25 b.p. ), and between September 11 and September 20 (16 b.p.). But each of those spikes partially reversed over time. In fact, after September 20, the time series began a protracted downward trend that left expectations at the end of 2007 below their level at the end of the summer. Let’s zoom in on the picture (chart 2). Expected inflation for the far future, the forward rate, did rise in the second half of January. Interestingly, most of the rise happened between January 16 and January 22, perhaps fueled by discussion of the fiscal stimulus package (the President made a call for tax relief on January 18). I guess markets don’t have much faith on the fiscal discipline of the government. More relevant to the immediate future of the economy: over the second half of January the spot BEI—the rate of expected inflation for 2008-2012—went down. 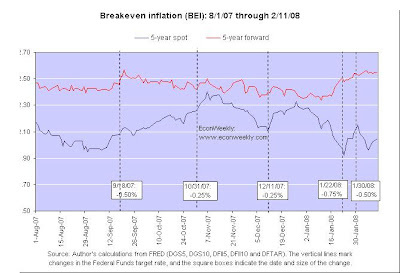 Inflation expectations briefly increased after the January 22 rate cut. But overall, between the 15th and the 30th, expected inflation for the near future fell slightly. On January 30th and subsequent days the spot BEI fell, which is quite exceptional, because it tends to increase every time the Fed eases—just look at the record in chart 2. In February inflation expectations for the near-future have continued to abate. Just in case the leaves don't let me see the tree, let me now zoom out and smooth out the time series (see chart 3). The recent rise in inflation expectations for the far future (the forward rate) to which Mankiw and Salmon referred, barely registers. In fact, those expectations have remained quite stable throughout 2007. On the other hand, expected inflation for the near future (the spot rate) started a downward trend in mid-2006. And January certainly didn’t put an end to that trend. What do we make of this? Worries about an economic slowdown have been simmering ever since house prices began falling, back in 2006. They have intensified as the credit crisis unfolds. Much like knzn, I think that markets expect a deceleration of demand, and hence of prices. Generally speaking, monetary policy has not convinced the public that the slowdown can be avoided, and neither has the fiscal stimulus package. 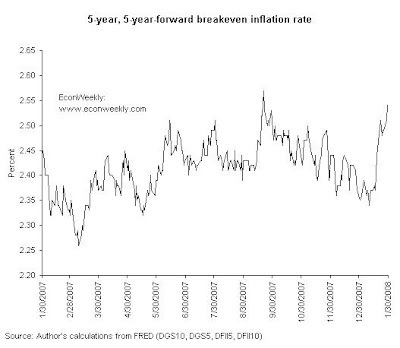 Regarding the far future, inflation expectations are contained. 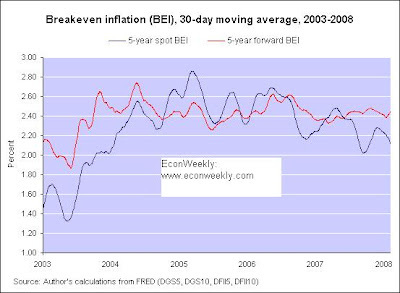 Addendum: why isn’t the break-even inflation (BEI) equal to expected inflation? Earlier I wrote that the spread between TIPS and nominal notes is only an approximation to expected inflation. Here I include a list of reasons why the equality doesn’t hold exactly. Please let me know if I miss something. By taking the spread between nominal (i) and real (r) interest rates, we ignore the interaction term pi*r. The BEI rate therefore overestimates expected inflation. If we take the yield on TIPS as an estimate of r, it’s easy to correct for this (just divide the spread by (1+r)). This bias, however, is tiny in the US nowadays, since interest rates are in the one to five percent range most of the time. Every day, the principal of TIPS is adjusted using the change in the Consumer Price Index. In principle, since the CPI is published only once a month, and with some delay, the adjusted principal would be updated using a lagged measure of inflation. Investors would require compensation for the difference between current and lagged CPI, and the BEI would overestimate (underestimate) expected inflation if lagged inflation were higher (lower) than current inflation. In practice, we need not worry about this bias in the US, since the Treasury seems to have come up with daily inflation adjustments—I suppose by extrapolation of past CPI figures. Also, the bias is tiny, since monthly CPI increases are small, and not systematic, since the rate of inflation is not consistently increasing or decreasing month-to-month over long periods of time. The principal of a TIPS is protected from deflation. At maturity, the investor receives the greatest between the original principal or the inflation-adjusted principal. Because this protection is valuable, the yield on TIPS is lower than otherwise, and the BEI overestimates expected inflation. In practice this bias is negligible, because the probability of deflation is extremely low. TIPS offer protection against inflation volatility. If investors are risk averse and inflation changes over time, TIPS are more valuable than securities whose value suffers from inflation risk. The yield will be lower, and the BEI will overestimate inflation expectations. TIPS are less liquid than nominal notes. Because liquidity is valuable, the price of TIPS is lower and their yield is higher than if these securities were as liquid as nominal notes. For this reason the BEI underestimates expected inflation. At times of high market volatility, some investors “fly” to liquid securities, in this case nominal Treasury notes, driving yields on those securities down, and introducing a negative bias to BEI as an estimator of inflation expectations. In real terms, the payments from TIPS are constant, whereas the payments from a nominal note decline. The inflation-protected security has therefore a longer duration—sensitivity to interest rate changes—than the nominal security, with respect to the real interest rate. I only want to make an appointment: it is possible that the real inflation and the exppexted inflation depens on the date you are talking about. An example of this is the economy of our litle country: Spain. We are near of a Nacional Presidential Election so the inflation here now "only depens" on the candidate is talking about it. The reality is coming a month after the election. The inflation can be a politic issue too! There's a whole literature about rational inattentiveness: that consumers only update their expectations once in a while, in particular when the inflation rate suddenly changes, as has been the case recently in Spain. I'm not familiar, however, with studies about the influence of politicians' claims on expected inflation. Something to look into. I'm planning on writing about the Spanish economy in two weeks. Stay tuned. Thanks for stopping by. Excellent post on inflation. Could you explain whether the inflation premium can be measured -directly or implied? I'm assuming you're asking about the inflation risk premium (which I describe in point 4 of the addendum to the post). I don't know of a good method to estimate the inflation risk premium. I know of *a* method: the one used by the Cleveland Federal Reserve. But I don't like it because it relies on estimations of inflation expectations from the Survey of Professional Forecasters. That survey is updated quarterly, so you can't use it to estimate changes in the premium at higher frequencies. I can explain the Cleveland Fed's method, but it's best if you read it yourself. The inflation risk premium depends on the degree of risk aversion and inflation volatility. I can accept that risk aversion is stable over time, so *changes* (not levels) in the BEI rate are good proxies for changes in inflation expectations. But inflation volatility is definitely not constant in the long run. So the Cleveland Fed's method, which assumes a constant inflation risk premium, doesn't look reliable. The best methodology I know of is the one used by Sack (2004) "Deriving inflation expectations from nominal and inflation-indexed Treasury yields." But his method corrects only for the liquidity premium and the duration premium, not the inflation risk premium (see page 8 of the paper, last paragraph). Sorry I can't help. Please let me know if you find something interesting.